There will be two sets of conferences this school year, one in October and one in March. 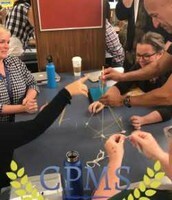 The fall conferences will follow a bit of a different format in that we are focusing time to connect with students and families who need some extra support. Once those groups are scheduled, the remaining times will be opened to other families. The elective teachers will be available on a drop-in basis throughout the conference hours. 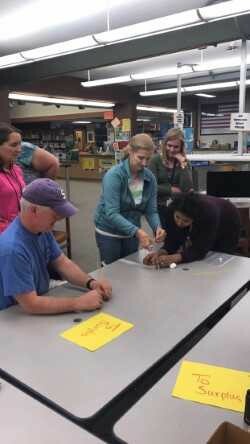 At our first admin directed early release, the entire staff participated in the marshmallow challenge. 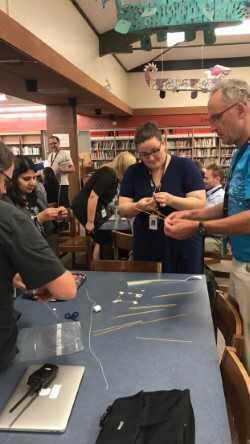 We learned the value of focused collaboration and learning from failure. 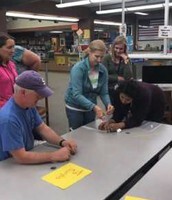 It was fun and moved our PLC work forward. The Beaverton School District is nationally recognized for high student achievement and innovative programs. 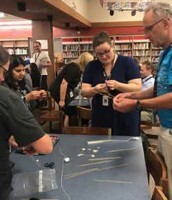 Beaverton students in grades 6-12 have the opportunity to investigate learning options that best fit their academic needs. Students can choose their neighborhood school or one of a number of small learning options. Transportation is provided. Applications will be available starting Monday, October 23rd, 2017. All applicants must reside within the Beaverton School District boundaries. Current Beaverton School District students are encouraged to apply online using their student ID, once the application portal opens. Resident students not currently attending a Beaverton school will need to complete a paper application. AVID Volunteer Tutors Needed and New Paid College Student Tutor Position! The Beaverton AVID Program teaches students the skills and behaviors necessary for academic success in high school, college and beyond. • AVID tutors work with small groups of middle school students under the supervision of a teacher. • Tutors are trained to use specific strategies that help develop students’ critical thinking, literacy, and math skills. • Tutoring is held mainly on Tuesday & Thursday, and times vary depending on the school and volunteer availability. • Training and ongoing support provided. • Community or Parent Volunteer Application and Background Check required. Did you know that we are in the process of adding a new grade in our Beaverton elementary schools? That’s right… we are in the process of planning for a seamless, integrated Pre-K in multiple elementary schools next school year. Are you interested in being part of this exciting movement? If so, we want you to know that we will be starting a Pre-K-3rd grade Cadre soon. Applications for this Cadre will be sent out in the Weekly Bulletin, ELA Memo, and by email on October 6th. Please look for the application and consider partnering with BSD staff, Early Learning partners across the State, and business leaders as we develop a comprehensive, integrated Pre-K in Beaverton. Kudos to Megan Irwin, our Administrator for Early Learning, and a host of other individuals and departments for their support in this critical endeavor! Applications can be found HERE. ParentVUE allows parents and guardians to access real-time information related to their students. Parents/guardians can view their child's calendars, attendance, schedules, report card, and grade book information. While our fall sports are up and running our winter teams are preparing for their season. The BHS Basketball and Wrestling programs offer youth players, in our feeder region, the opportunity to participate in youth camps and teams. Come out and join a team and start your BHS journey. The BHS women’s basketball program is offering free youth clinics. **Get a chance to meet all of the coaches at the start of the October 5th clinic. These clinics are for any youth girls (4th - 8th grade) in the Beaverton High School region. ALL basketball skills levels from the beginner to the more advanced are welcome. Clinics are not mandatory nor will it affect anyone from the winter youth tryouts. They are strictly for improving your basketball skills, fun and learning the game!!! These clinics are completely free. We know that kids play other sports or activities, so come when it fits your schedule! We are hoping you can attend at least one so we can meet you and get you on our email list. All clinics are at Beaverton High School. The week of Oct 23rd will be the tryouts for the Winter Season....we will have all the information on this at a later time once we find out how many kids are playing and who will be coaching the teams. We are striving to contact all interested players through emails, newsletters and individual schools. If I have left someone off the list please let me know. Thanks! We can’t wait to meet all of you! Cedar Park 5K Fundraiser a HUGE success! The second annual 5K Fundraiser on Friday, October 29th was awesome! We had a great turnout of community and parent volunteers, and all the kids got to run on the same day. Wow!!! What a great day for a run!!! We had some great participation from the students and it looks like just the 7th graders got a good soaking. Next week, keep an eye out for up-to-date information as to who our fastest runners were in each grade. We'll also have an update on how close we are to reaching our goal of $50K. Get those envelopes into the office or donate online!!! Cedar Park has approximately 1,000 students this year. Just think, if every student were to collect $50 in donations, we'd reach our goal of $50 easily. Don't forget to use your corporate matching programs, if available, to increase your donations. We're at $46K so 92%!!! Questions? Go to www.cedarparkptc.org/fundraising for more info. If you're like most busy parents these days, you're shopping on Amazon at least once a month (but let's be honest - it's really like once a week). 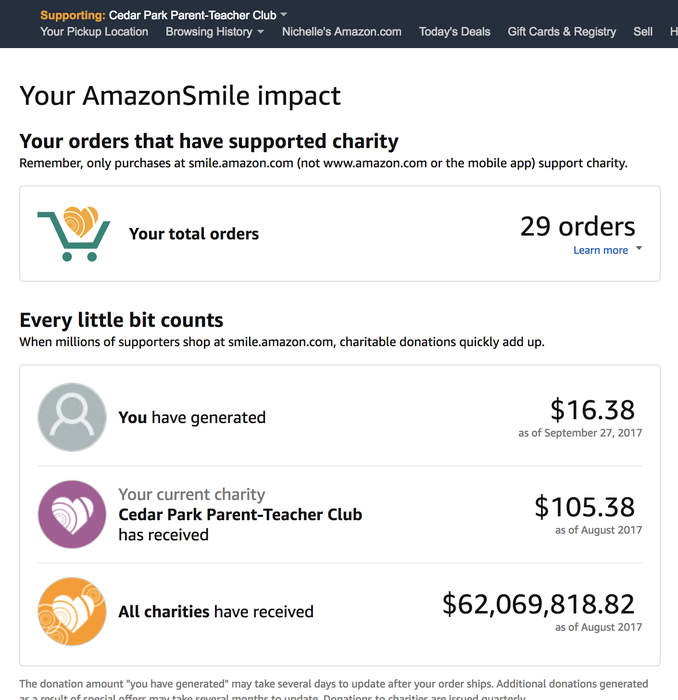 Did you know that shopping on Amazon can generate donations for Cedar Park Middle School and you don't have to spend any extra money? 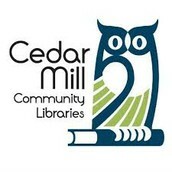 The Cedar Park PTC has set up a Smile.Amazon account that generates portions of your qualified purchases to come back to Cedar Park - and you don't have to do anything but shop. All you have to do is go to www.smile.amazon.com and sign in to your regular Amazon account. Then go to "Accounts & Lists", select "Your AmazonSmile", and select your charity - "Cedar Park Parent-Teacher Club." Then watch the $$$ roll in... It's that easy. 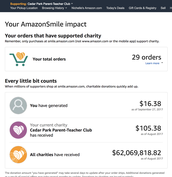 After that, all you have to do is go to smile.amazon.com to shop - it's just like the regular Amazon site, but they donate money to our school. How cool is that? It's so cool! Ms. Parks, 8th grade Humanities, and her advisory class are sponsoring a costume drive in hopes that we will have many donations of clean/unwanted costume pieces. These costume supplies will be donated to our Drama closet here at CPMS. We will also make some costume supplies available to students who may not have anything at home to use for costumes on Halloween. It would be appreciated if you and your student found items to donate from your house. A community service project would be for your student to share the costume drive information with your neighbors and extended family. Attached to the Cedar Park email, we have included a flyer your student may use to help facilitate these donation requests. 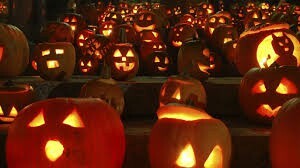 If students gather costume donations and bring them in, this counts for earning community and service hours. There are drop off places in the school, or student's can bring their gathered donations to classroom A5. 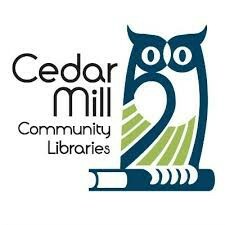 Every Wednesday from 3-4:30 PM, ages 10-18 can come hangout at the Cedar Mill Library to participate in several fun activities throughout the fall. With the change in start and end times, we are seeing an increase in students arriving to school too early. Students are not allowed on campus until 8:45 am, when supervision is provided in the cafeteria. Also, as many of you have noticed the change in dismissal time has allowed for all 19 busses to be ready to load kids immediately at 3:50 pm. However, this is causing a traffic jam in the parking lot where parents are used to parking and picking up their kids. The back parking lot is closed to parents between 3:40 pm - 4:00 pm. If you are picking up your student in the afternoon, we ask that you use the front driveway or the street at the East end of campus. Our new PBIS (Positive Behavior Intervention System) has a lot of exciting changes this year. First, our students will be recognized for demonstrating behaviors that represent our pillars: Perseverance, Acceptance, Courage, Knowledge. Instead of tokens, students will get tickets with their name and the recognized behavior on it. Students will enter their tickets into a PBIS Fishbowl, and we'll do random drawings for prizes throughout the week. Prizes may include Powell's gift cards, snacks, pizzas, BHS or SHS swag, Cedar Park swag, and lots more. Thank you to the PTC for helping support our PBIS reward drawings. By adding the design principals and criterion to the science classes (many of them are already embedded in the Next Generation Science Standards), we found a need for an additional elective for about 1/3 of our students. With the emphasis on STEM and the love of science that many students have, we developed a science enrichment. 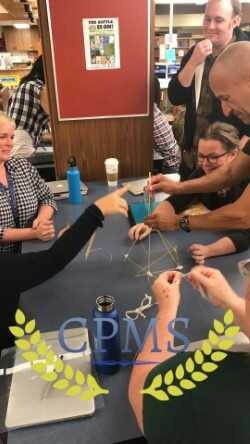 Teachers work together in grade level teams to choose topics of study and develop lessons that are engaging and outside the curriculum. Some of the labs are the "fun" stuff they just don't have time for in the traditional school year/day. So far the response has been very positive, and we're hoping to continue developing more science engagement for our students.